There are many shapes of diamonds to consider when buying a new diamond for your engagement ring or other diamond jewelry. 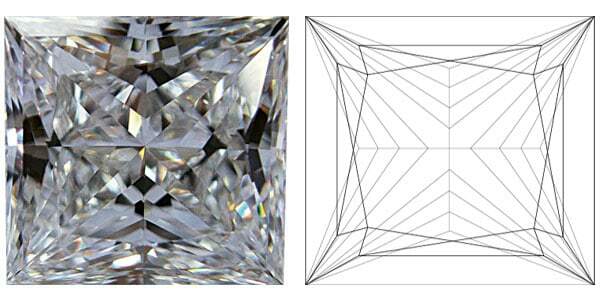 How the diamond is shaped has a significant impact on its appearance. The most popular choice for a diamond shape is the brilliant cut or round cut diamond, although modern consumers prefer alternative shapes like the princess or radiant diamond.We have listed some of the most popular diamond cuts which you can also find on our site. At Antwerpdiamonds.direct we offer all the popular diamond cuts in our diamond search. In the overview below you will learn more about each of these shapes and their unique characteristics. We hope that knowing more about each type will help you find the perfect diamond for you or your loved one. Every shape is unique and its distinct set of characteristics will determine its cost , beauty and quality. As the most popular choice and most known diamond shape, round diamonds make up the vast majority of the supply. Generally used in rings and solitaire sets, these diamonds generally require a four pronged setting and can add immense shine and brilliance to a particular piece of jewelry. 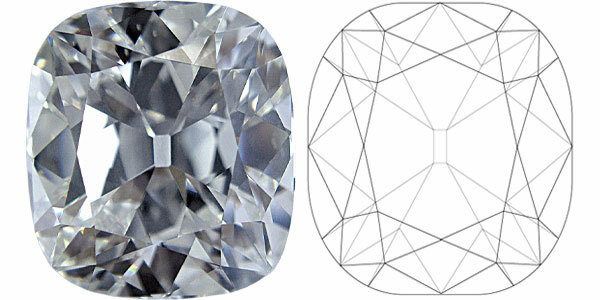 The round cut diamond is also known as the brilliant cut. The modern round brilliant consists of 58 facets (or 57 if the culet is excluded. With all other characteristics equal , round cut diamonds are more valuable then alternative shapes.They have the best fire and brilliance due to excellent light refraction properties. These diamonds have a length to width ratio between 1 and 1.02 . Only introduced in the 1980's, the princess cut diamond has quickly gained in popularity and is today the second most sought after diamond shape. One of the advantages of the princess cut is that existing inclusions are less visible thanks to the unique cutting and polishing techniques. The downside of the cut is that it also brings out color more clearly. In addition when cutting a princess shape there is less rough diamond lost, in fact more than 60% of the original stone's weight is utilized.But there is one precaution that you will have to bear in mind while using loose diamonds on this shape. This variety is more prone to chips and cuts, especially around the corners. Make sure that the stones are well protected and properly set into the base when using them in any form of jewellery. These diamonds have a length to width ratio between 1 and 1.05 for square shaped stones. If you prefer rectangular select a ratio of 1.1 or greater. 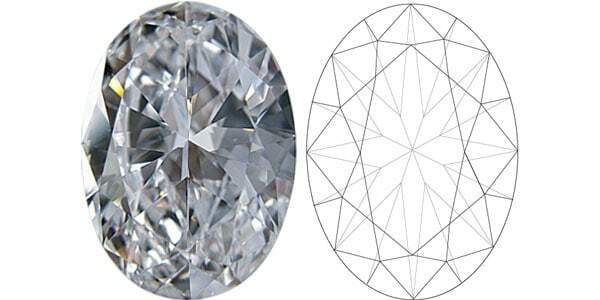 This shape was introduced in 1902 by the renowned diamond cutter Joseph Asscher. The cutting techniques are very similar to the emerald cut, but differentiates with unique angled and cropped corners to create a distinct look. Since the cut makes imperfections more visible it is recommended to choose a diamond with clarity SI1 or better. It requires a four-pronged setting and goes well with contemporary jewellery designs. These diamonds have a length to width ratio between 1 and 1.05. A cut relatively new to the diamond industry, introduced late last century. 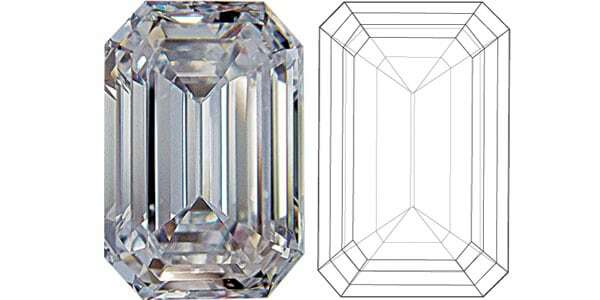 This unique cut is a hybrid of the round cut and the emerald cut. Radiant cut diamonds( as their name suggests) emit a beautiful glow. If you like the fire of round diamonds but prefer the shape of an asscher or emerald diamond, the radiant cut will present you with the perfect combination of both. As this shape shows more color we recommend opting for a higher color rating ( H , I or higher). These diamonds have a length to width ratio between 1 and 1.06 for their square-shaped radiant. If you prefer a rectangular shaped radiant , choose a ratio of 1.10 or higher. This cut has been around since the early 1800's and is today recognized as one of the more antique-like shapes. If you prefer jewelry with a more vintage style look the cushion cut is your shape of choice. Some of the most well known historical diamonds are cut in this shape (eg the renowned Hope diamond). This cut is often described as pillow-shaped. When choosing a square shaped cushion, look for a length-to-width ratio between 1 and 1.05. If you prefer rectangular shaped, choose a ratio of 1.15 or greater. Emerald diamonds are known as the more sophisticated diamonds. The emerald cut is rectangular and has large step-facets. Because of this inclusions are easier to detect with the naked eye. For this reason, we recommend diamonds with a clarity grade of SI1 or better when you select an emerald cut diamond. Due to its size and shape , the diamond is popular among budget conscious jewellery consumers. These shapes look best in rings that highlight clarity and size , typically settings with small accent diamonds. Often used in rings, these gemstones can bring sophistication to any jewellery design, adding long lines and broad flashes of light. With their particular shape they can look larger than they actually are. These diamonds have a length to width ratio between 1.25 and 1.5.
this diamond shape has narrow pointed edges. 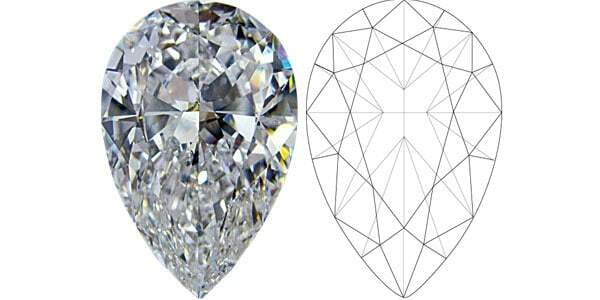 With their extended length, these shapes appear larger than other diamond shapes with similar carat weights. A popular choice for accessory pieces like necklaces, earrings or pendants. These diamonds have a length-to-width ratio between 1.7 and 2.3. Created by Lazar Kaplan in the 1950's the oval diamond is a perfect choice for the budget consumer. Cut with the same number of facets as the round shaped brilliant, the oval diamond shape emits nearly the same level of brilliance and fire. With its elongated oval shape, it appears longer than a round diamond of equal carat. When set in a ring it creates the illusion of longer fingers, making it extremely flattering on the hand. Oval cuts have the disadvantage to show more color easily so we recommend selecting stones with a color grading of H or higher. These diamonds have a length to width ratio between 1.3 and 1.55 . These are the more classy variety and can add a look of subtle elegance and sophistication to any piece of jewellery. 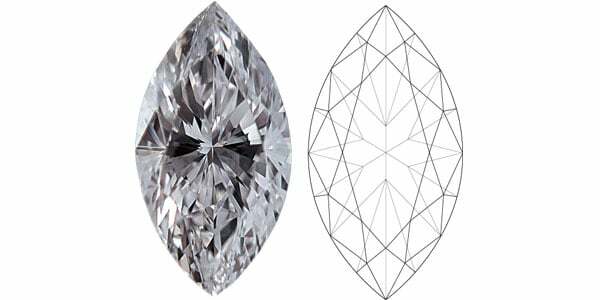 Shaped like a sparkling tear drop, a pear shaped diamond can get you to enjoy the best of both round as well as Marquise shapes. These diamonds go best with pendants and earrings but can also be used in bracelets, rings and other ornaments. Loose diamonds shaped like tear drops can be used to create some interesting jewellery designs, making them the top choice for people who prefer subtlety over extravagance. Our diamond education pages help you to understand the 4 C's of diamond quality so yo can choose your next diamond wisely. Learn more and save money buying diamonds online. Get your FREE guide today.